Letter to Hillary Clinton soliciting assistance for American victims of domestic violence living abroad. In 1995, during the United Nations’ Fourth World Conference on Women in Beijing, you stated that “human rights are women’s rights and women’s rights are human rights once and for all,” launching you in the public-eye as a champion for women’s rights around the world. Unfortunately, even the most vociferous and well-intentioned rhetoric of politicians does not automatically translate into reality for their constituency, as my experiences with the Department of State in the past 7 years has demonstrated. Publically, the Department of State espouses a commitment to advancing human rights and ‘empowering’ women. 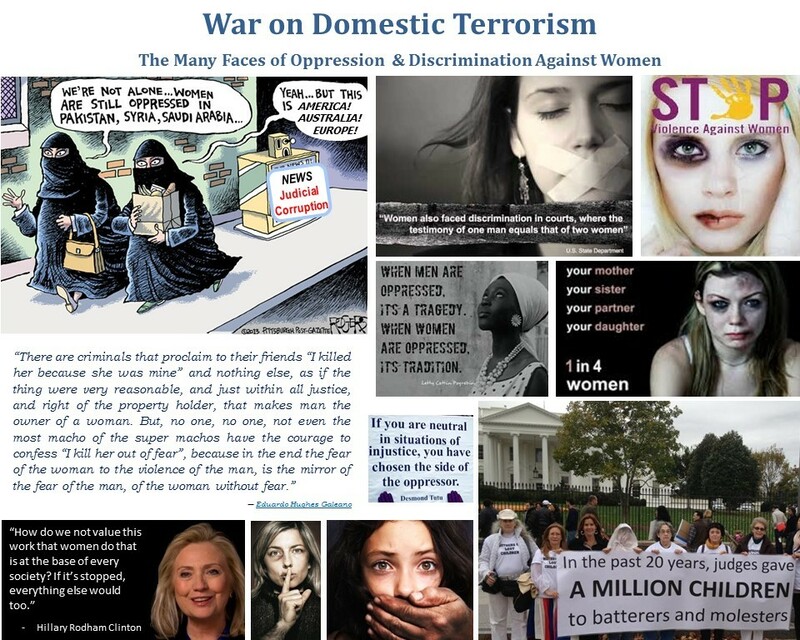 However, when faced with the reality of American victims of domestic violence living abroad, their policies discriminate against women, and support and empower abusers. (See enclosed Family Courts in Crisis Oct. ’13 newsletter –The Emperor’s New Clothes which enumerates the issues). For thousands of years societies have been based on the oppression of women, a dynamic maintained through domestic abuse and violence. Rhetoric alone will not change this situation, and the reality for the untold millions of women and children around the world who are victimized on a daily basis, with family members, neighbors, and authorities claiming that it is a ‘private matter’ and the ‘patriarchal’ right of the husband and father. This has been the rhetoric and stance of the State Department (and Spanish courts) in its communications with me during the past 7 years. Please find enclosed my latest correspondence with the American Embassy in Madrid. Previous correspondence to the State Department & American Embassy in Madrid (2007-2014) are posted on http://worldpulse.com/node/64031 & http://worldpulse.com/node/73335, and document the continual refusal of State Department officials to comply with 7FAM, CFR 22, USC 22, the Convention of Consular Relations, and international law in defending the rights and interests of American women & children living abroad. As an advocate for women’s rights, I hope you might encourage the American Embassy in Madrid to comply with their ‘responsibility to protect’ under international law and officially request that the appropriate Spanish authorities examine my case, allegations, and evidence presented to the Spanish authorities, as provided for under Spanish law. Additionally, I hope you might encourage appropriate authorities within the US Department of State to take positive action in the implementation of 7FAM guidelines (1700s & 1900s) in US Consulates across the globe. In order to assure that the rights of victims living abroad are protected and respected in foreign judicial proceeding, (whereas the violation of their rights and cover-up for evidence of domestic violence is widespread & extensive in judicial systems around the world), it is imperative that US Consulates implement these guidelines in concurrence with US federal and international law. For your convenience, please find attached a presentation of Global Expats / www.global-xpats.com; an organization modeled after the American Women’s Club Overseas (FAWCO), but a revenue generating entity designed to assist expatriated families living around the world while providing a comprehensive solution to the dual-career challenges of the expat family. My desire and efforts to start Global Expats, and my ex-husband’s extra-ordinary efforts to prevent me from doing so, have been at the root of his violence and abuse from the beginning. My case is no different from any other woman in this world whose husband, in his efforts to dominate and control her, destroys her labors to become financially self-sufficient – with everyone in the community (and courts) claiming it is his ‘patria-filial’ right to do so. What makes my case unusual, however, is that the business model I was developing in 2005‑07 (local-search directory-ie.Yelp.com, citysearch.com, local.com) are presently generating revenues of $320 million/year; meaning that total financial damages (caused by the negligence of the Spanish judicial system and the refusal of the State Department to fulfill their ‘responsibility to protect’) amounts to approximately $864 million. I believe it would be in the best interest of all parties that these issues be resolved in an expeditious manner, thereby avoiding the necessity for protracted, high-profile litigation within the international courts in the near future, and I hope that you might assist me to this end. Thank you in advance for your time and consideration. For more information about me and my work, please consult www.linkedin.com/pub/dir/Quenby/Wilcox, and blogs on Huffington Post (www.huffingtonpost.com/quenby-wilcox-/) and Womenalia (www.womenalia.com/us/blogs/having-it-all)If you should have any questions, I may be contacted at my email address, quenby@global-xpats.com.